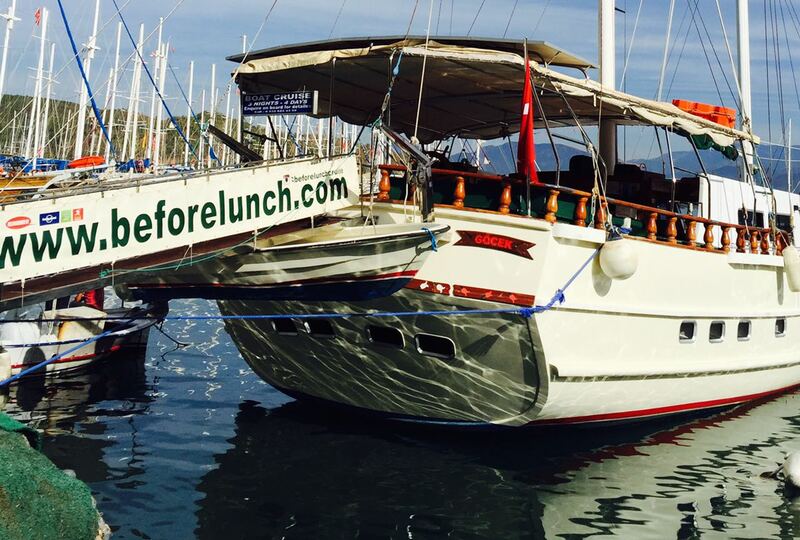 Our boat is called “ROS” and is moored in the Fethiye harbour where all the tea gardens are, along from the yellow Taxi’s, near the Ozsut Cafe. Please remember we cannot take credit cards so bring the total amount or less your deposit, in cash, Euro’s or Turkish Lira. You need to be at the boat before 10.00am on day of departure. Also let us know where you are staying the evening before the cruise, and a mobile contact. Please remember not to bring any drinks on board. If you happen to be in Fethiye the evening before your cruise, walk along the harbour and have a look for the boat so you know where to come for your departure the next morning. On the morning of your cruise, arrive at the harbour and board the boat. We will allocate you a cabin and let you know the Do’s and Don’ts on board. Before lunch we depart the harbour, it takes a couple of hours to our first destination. During the day the boat will anchor in bays and coves along the way for swimming and snorkelling. Help yourself to cold drinks using our honesty system. We have Ice Cold Beer, Red and White Wine (The best in Turkey), Spirits, Soft Drinks, Bottled Water and Cocktails. All the cabins have private en-suites (150 x 150). We also have Family cabin for 4 people with a double bed and 2 single beds, 4 windows. The double bed mattresses are standard size, all ensuites have flushing toilets, 2 windows in each cabin 50 x 30 and one in the bathroom. Huge Deck for sleeping under the stars with 25 comfortable sun beds. Pillows, sheets, blanket and hand towel. Please bring a beach towel if you wish.